I am the mother of two kiddos…a tween girl and a teen boy and I STILL make their beds. Not every day (as if that makes the whole thing better,) but practically every day. This revelation is something that I rarely talk about and a topic that makes me a little uncomfortable sharing. At first glance, it probably sounds like I’m some sort of Martha Stewart control freak or worse yet–a mother who coddles her kids too much. I can hear it now, “She STILL makes their beds? Really? Wow. How old are they?” On more than one occasion I’ve been accused of not letting them grow up, trying to make them permanent dependents, permitting/encouraging laziness and impeding their emotional development. Ouch! An unmade bed is a pet peeve for a lot of people. I get it. Honestly, I know it’s a little (or a lot) quirky, but I really don’t plan on stopping anytime soon…and I have my reasons. I’m a creature of habit. When the children were little, I would use the time that I spent in their bedrooms as an opportunity to pray for them. Nothing fancy or formal…just a few quick words. Praises for the good days and prayers for strength on the tough ones. And while we have prayed with the kiddos at bedtime ever since they were teeny tiny, I quickly discovered how much I think about my children when they’re away from home. When my son went off to school I missed him terribly. It was just preschool and just a few hours a day, but I wondered how he was doing? What he was doing? If he was okay? And on and on. Instead of spinning in this cycle of worry, I decided to get pro-active and purposefully pray for his day while I made his bed. And I never stopped. When my daughter came along, I added her to the daily ritual. In the five minutes it takes to make a bed I would pray for his/her well-being, his/her character, his/her faith development, those in their classrooms, their teachers, their circle of friends, etc. I prayed offensively and defensively. Some days I give thanks and other times I find myself on my knees (things sure get complicated as they grow up!) But most importantly, I pray regularly. After so many years, this daily practice hasn’t changed much. Some days I sing hymns as I go about straightening up their rooms. I mostly pray silently, but occasionally I pray out loud. The family dog even gets in on the action. She frequently comes into the room and guards the door…she knows the routine and has become something of a prayer partner. 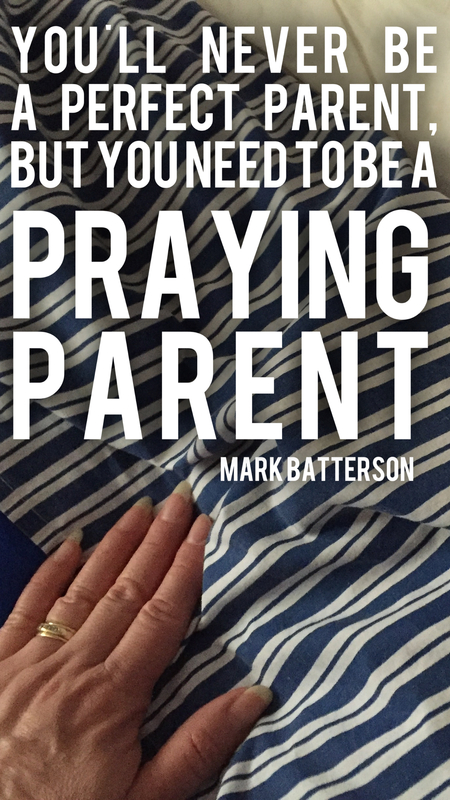 This past week I have been in earnest prayer for one of my kiddos and decided to write about my prayer pattern. What’s been reinforced to me lately is that praying includes a lot of listening, too. And I am grateful for that. What started out as a personal antidote to worry and stress has proven itself time and time again as a recipe for peace and assurance…and I thought it was worth sharing with my fellow parents in the trenches. Someday my kids will make their own beds (and in case you’re wondering, YES, they know how.) But for the time being, I’m happy to straighten sheets, tidy up pillows and simply pray.